When it comes to food and eating, the Italians get most things right, and salumi is no exception. It's just cured or preserved meat, much like French charcuterie or German Pökelfleisch (yeah, I had to look that up) and many other countries do the same sort of stuff. But the Italian style stuff is, in my gluttonous opinion, the best of the lot. Notice I say "Italian style," because the stuff in that photo is a local version. 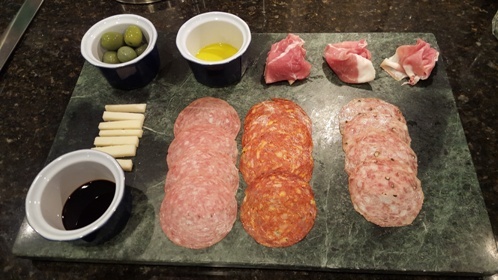 The only imported meat on that platter is the prosciutto, and it was far inferior to the New Jersey salami and soppressata. One of the nice things about putting together a platter like this one is that you get to try a bunch of different things without getting so stuffed that it is impossible to eat the rest of the meal. I got these meats sliced very thin, so each piece is a tiny taste, but with lots of surface area so it seems like it is a substantial taste. And those olives? Castelvetranos, originally from Italy, which I think are superior to the famous Picholines from France. The cheese is a Pecorino Romano, which is a sheep's milk cheese from, you guessed it, Italy! It has a nice sharp tang and a great texture. I like cutting it into those short sticks because you get the texture as well as the flavor. The ramekins of olive oil and balsamic vinegar are optional, but they look cool, so what the hell. As usual, the highest highest expression of French Toast is its savory style, which isn't tainted by the foul exudation of some tree. Come on...admit it...it looks great! Misanthropic Humanitarian sent this to me, and I'll be damned! It makes cabbage look great. I am definitely going to try this, mostly because anything with Parmesan and garlic has a very good chance of being tasty, but also because I can feel virtuous while actually eating something that tastes good, as opposed to some quinoa salad with chopped bark and a raw water dressing. I have been experimenting with tequila and orange, and while I haven't created anything memorable, the drinks have been at least pleasant. I shake small chunks of cut orange with the peel, some tequila, a splash of agave nectar and a tablespoon of Cointreau. To counter the sweetness of the orange I have been using about a dozen drops of Thai Bitters, which adds a zing that I really enjoy, but that might not be everyone's cup of tea. I think I will try fresh jalapeno next, because that sounds so damned authentic, and I like the flavor. Anyway, I haven't nailed this one yet, so any input from my fellow drinkers would be much appreciated. Food and cooking tips, tender meatballs, Marlin 1894Cs, gefilte fish replacements, thick and fluffy pita and good tomatoes that aren't square, pale pink and covered with Mestizo E.coli: cbd dot aoshq at gmail dot com. Any advocacy of French Toast with syrup will result in disciplinary action up to and including being nuked from orbit.